Wayne Gretzky still doesn’t feel real to me. I am by no means the biggest stat head among the sports fan universe. To begin, I was never the best at math. But I’m not a prude — I’m constantly checking up on OPS leaders at Baseball-Reference and plus/minus at the Internet Hockey Database, and the absurd amuses and thrills me to no end. Let’s just marvel at ‘88-‘89 season for a minute: 40.0 mpg, 32.5 ppg, 8.0 rpg, 8.0 apg, 2.9 spg, 53.8 FG% (55.3%, if you don’t include his 27% 3PT%), 85.0 FT%, 34.8/7.0/7.6 in the playoffs. Yeah, so Jordan was insane. Bonds’ OPS+ (which is OPS adjusted for era/league/all that) in 2002, was 268, the highest of all time. In fact, if you take the top 10 OPS+ seasons of all time, Bonds appears first, second (2004, 263), third (2001, 259), and tied for 10th (2003, 231). Helping out the on-base numbers, Bonds set the record for walks in 2001 (177), 2002 (198) and 2004 (232). For good measure, he is also 10th all time with 151 bases on balls in 1996. Back to 2004: He was walked intentionally 120 times. 120 times! On the all-time list, that’s 52 more than the batter in second place. And yes, that was Bonds with 68 in 2002. He’s also third with 63 in 2003, tied his 1993 finish in 2007 with 43, and then appears ninth on the list with 41 in 2006. So the moral of this story is that Bonds terrified pitchers and managers. Rightly so. I’ll wrap up this little exercise with the Great One, the man who graced my bedroom wall from 1993 to 2000, Wayne Gretzky. Gretzky in the early 1980s was a demon on skates, the leader of the dynastic Edmonton Oilers. 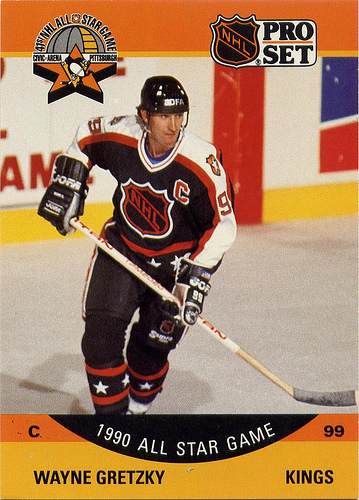 As a natural playmaker and a pass-first center, Gretzky scored at least 50 goals every season from 1979-80 to 1986-87. The high mark came in 81-82, when he set a record with 92 in a season (and scored 50 in the Oilers’ first 39 games). He went beyond 60 in 1982-83 (71), 1983-84 (87), 1984-85 (73) and 1986-87 (62). How many other players have topped 70 goals? Seven: Phil Esposito, Mario Lemieux, Brett Hull, Alexander Mogilny, Teemu Selanne, Bernie Nichols and Jarri Kurri. Hull did it three times, Lemieux did it twice, and Kurri was Gretzky’s linemate when he scored 71 in 1984-85. Assists: 163 in 1985-86. He also owns every spot in the top 11 in this category. Points: 215 in 1985-86. He owns all but two spots in the top 10; Lemieux ties him at fifth and 10th. Considering the low-scoring era we live in now, this nears the unfathomable. Even if goals are up this year, with Steven Stamkos leading the way, there will never be another time like then, and there will never be another Great One.